An installation of Bright Goods LED filament lamps has helped the Kitchen Table achieve energy savings of over 70% at the newly opened dining ‘theatre’. 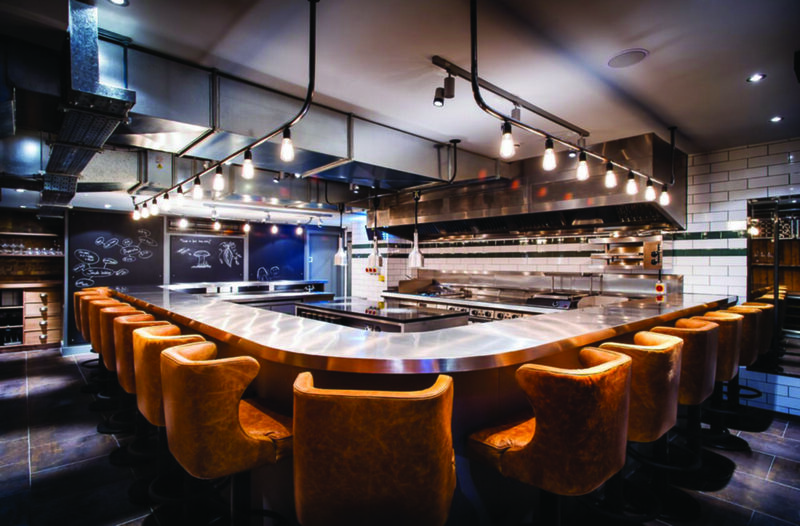 Launched to wide critical acclaim, the Kitchen Table wanted to deliver a unique experience to members of its dining audience who are positioned around a theatrically-themed open kitchen. Deep tan leather chairs placed strategically around a brushed aluminium bar-style table ensure that every diner has the best seat in the house. From these seats, diners are able to follow every stage of the meal preparation by the Kitchen Table’s Head Chef, Michelin-starred James Knappett. It was important for James and his wife Sandia Chang, who manages the restaurant, to incorporate lighting that would enhance the overall ambience of the unique experience and they opted for the Victoria LED filament lamp from the Bright Goods range. The Victoria is the perfect choice for the Kitchen Table. Its innovative blend of 21st Century efficiency and 19th Century styling creates a stunning and welcoming atmosphere within the dining ‘auditorium’. With a classical shape that harks back to a bygone era, complemented by a fully-dimmable warm glow, the Victoria has proved to be one of the most popular offerings on the Kitchen Table’s menu. Alongside its classical appearance and unrivalled lighting levels, the super efficient LED Victoria has enabled the Kitchen Table to achieve energy savings of over 70% compared to traditional filament lamps. In common with all lamps in the Bright Goods range, the Victoria also offers ten times the lifespan and is covered by a comprehensive two year guarantee.